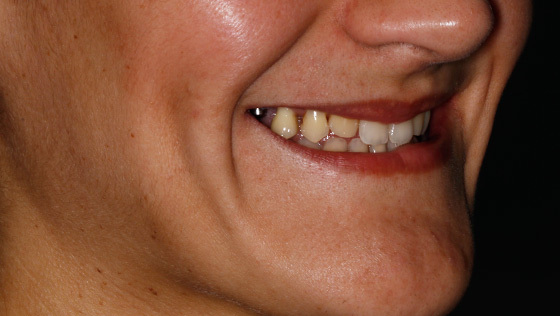 Dental agenesis is the lack of growth of one or more teeth, causing a functional problem (misaligned bite between neighbouring and lower teeth) and an aesthetic one (due to the lack of teeth and the resulting gaps). 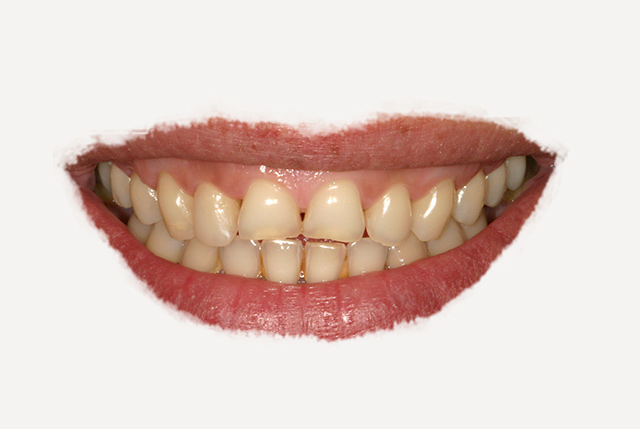 With the help of orthodontics, the canine teeth are moved to take the place of the missing lateral incisors. 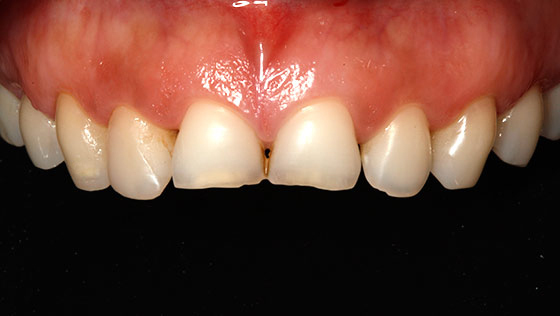 With this shift, we close up the gaps between the teeth. 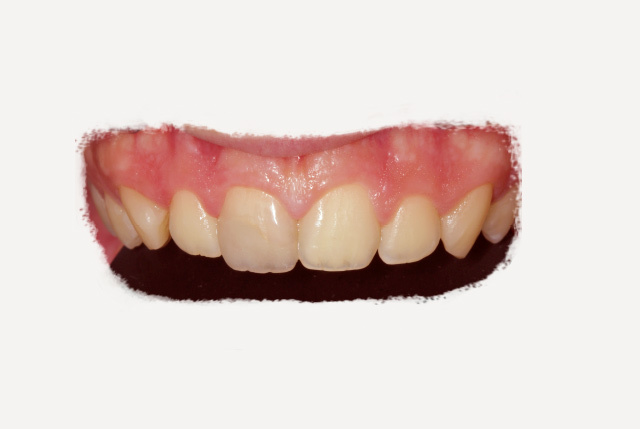 In addition, given that canine teeth are wider, bulkier and sharper than the lateral incisors, we make them smaller and finally apply porcelain veneers. 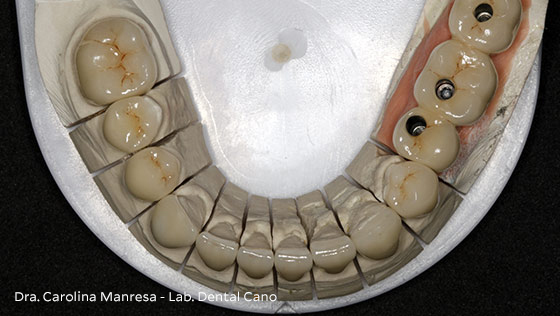 This treatment was carried out in collaboration with the orthodontist Dr. Fernando de la Iglesia. 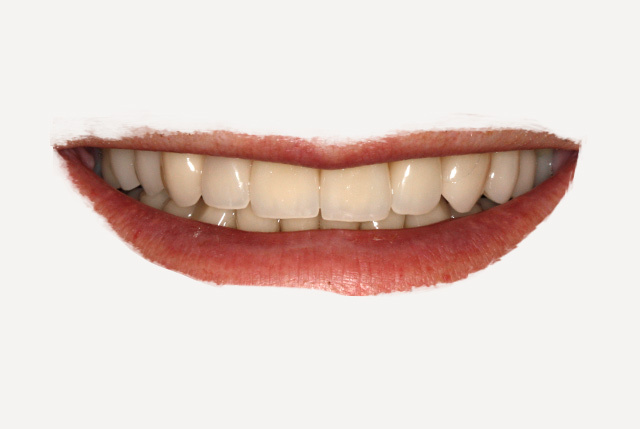 We managed to harmonise the smile, closing the gaps between the teeth and “camouflaging” the lack of lateral incisor teeth. 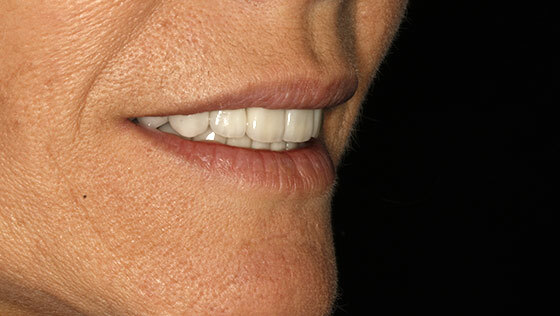 Porcelain veneers ensure a very natural result. 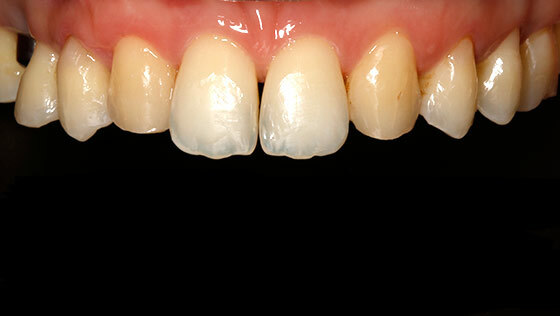 We sometimes have to deal with a tooth darkening after receiving an impact. 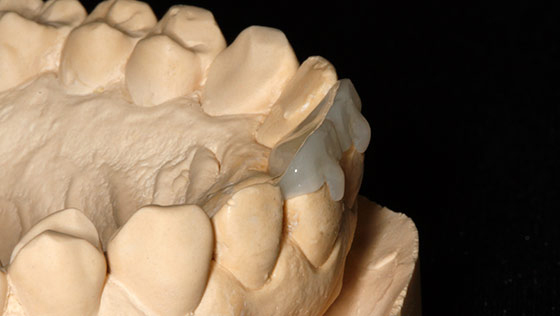 Though imperceptible at first sight, a blow to a tooth can cause irreversible damage. 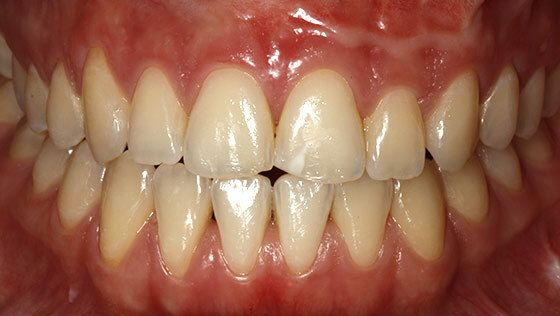 One of the most common occurrences following dental trauma is for the tooth’s colour to change. It begins to darken because its vasculo-nervous bunch (commonly known as “the nerve”) has been damaged. 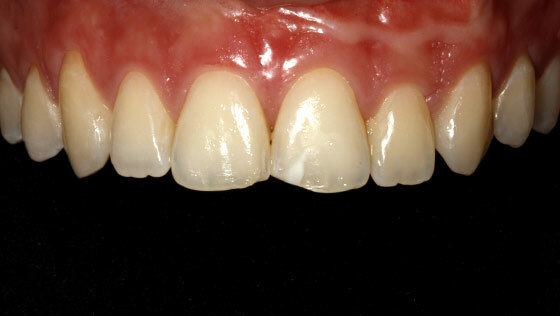 Following the endodontics (root canal treatment), we then go on to the internal whitening of the non-vital tooth. 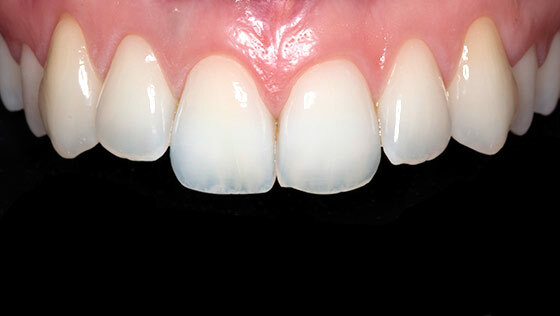 This whitening involves applying the bleaching product on the tooth in question once a week. For this particular case, 3 applications were necessary. 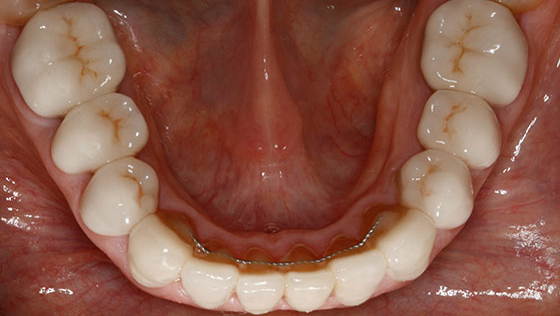 It is a simple yet extremely effective procedure. 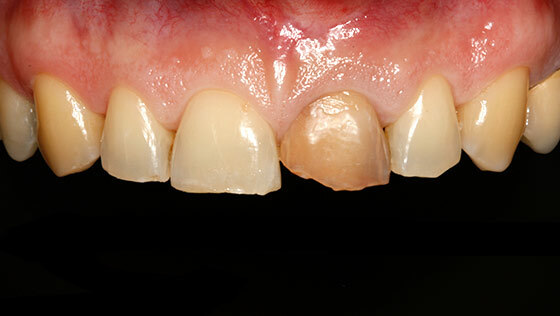 We recover the lacklustre tooth’s appearance and colour by using a simple, very conservative technique. 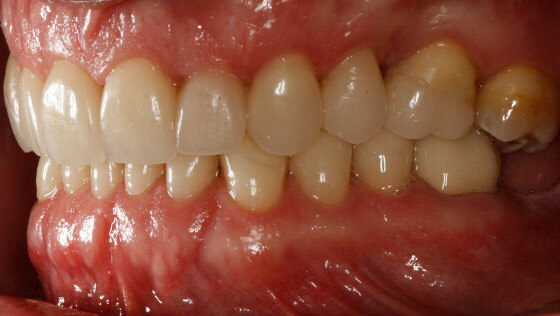 As we have seen in the previous case, a blow to a tooth can cause it to darken gradually because the nerve canal has been damaged. 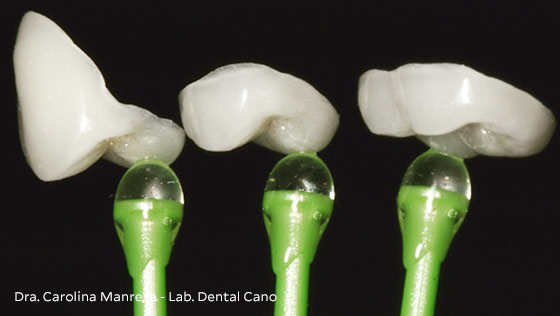 It is essential for the endodontics specialist to treat the tooth canal beforehand. 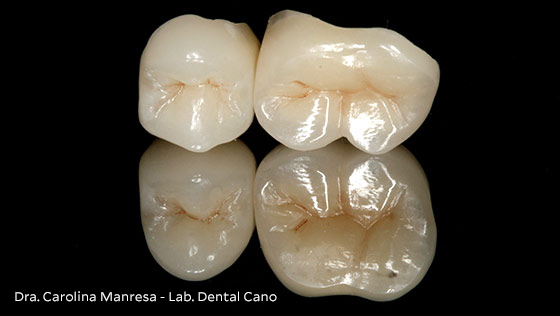 Once we have dealt with the canal, we go on to whiten the non-vital tooth on the inside. 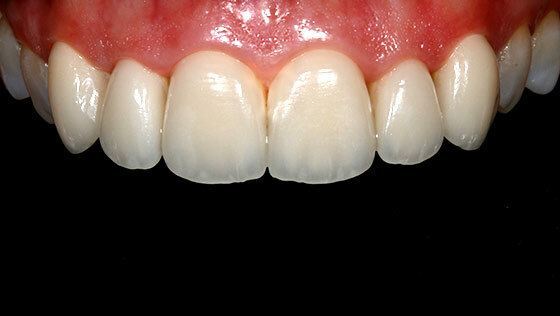 Finally, this case also requires a porcelain veneer to be made in order to permanently hide the tooth’s dark colour. 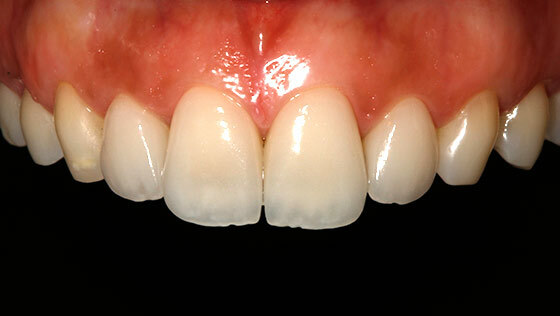 This case allows us to show the solution we use when the effect of internal whitening is not enough. 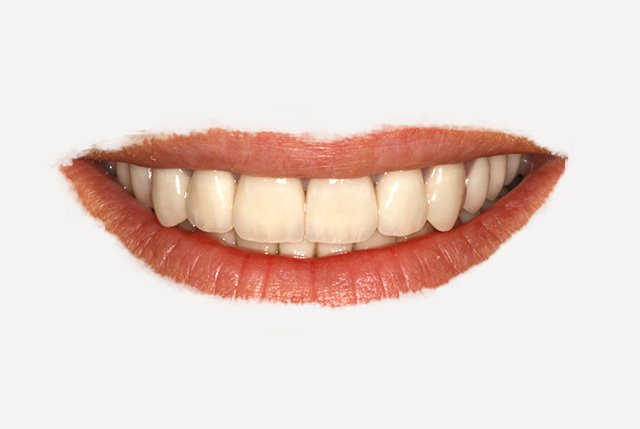 In this case, the teeth’s yellowish tone tarnishes their natural beauty. 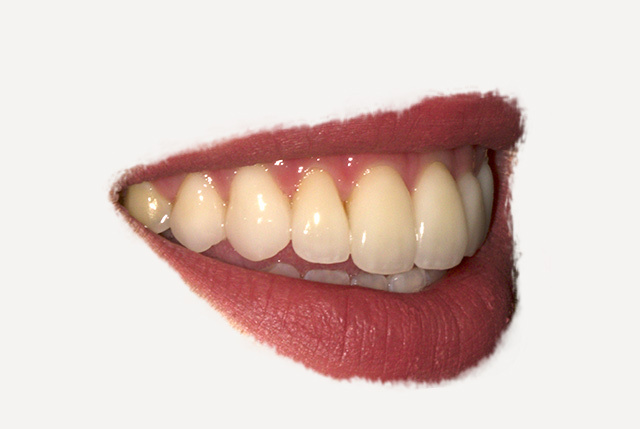 Tooth whitening is one of the most sought-after kinds of aesthetic treatment. 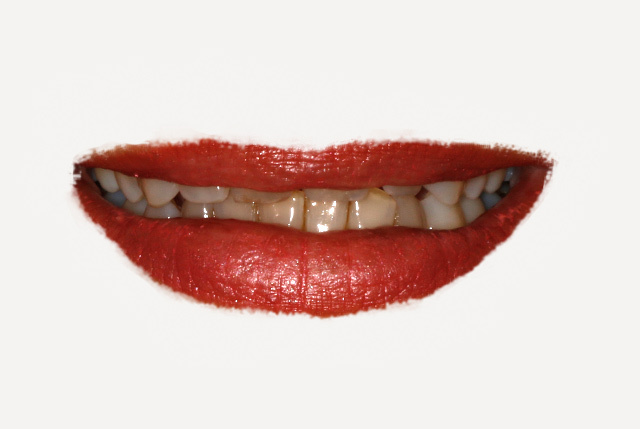 It consists of brightening the colour of your teeth. 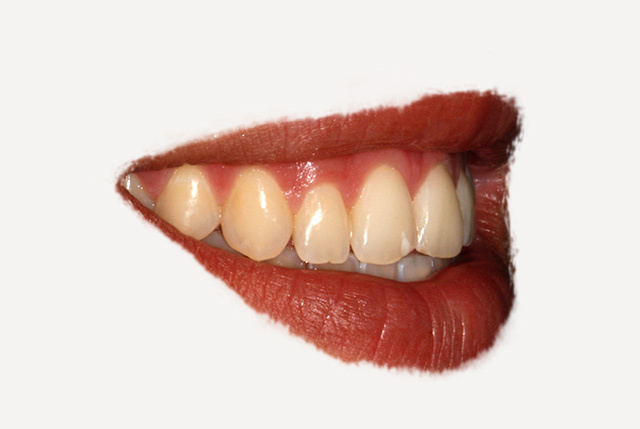 It is recommended for softening the teeth’s original tone and also to whiten them when they have become dark or pigmented. 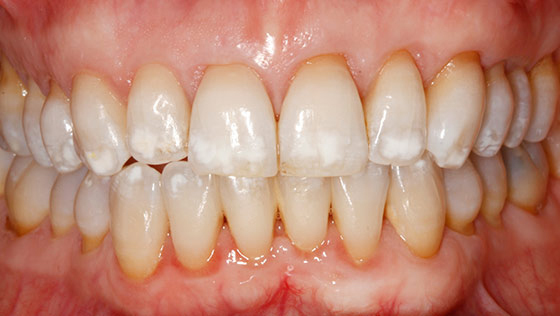 This is done by applying peroxides created for dental use, which release oxygen and thus cause the structure of the tooth to be brightened from the inside (dentine). 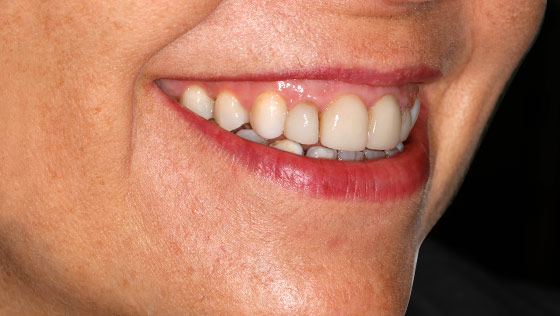 The procedure is safe and does not damage or wear out the tooth enamel. 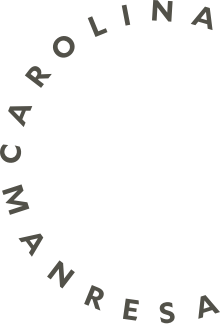 There are several techniques and it is possible to recommend either one or several sessions for applications in the clinic, at home or a combination. 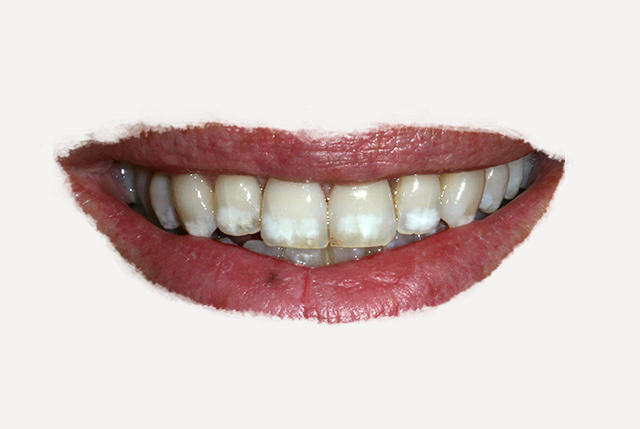 The results can be seen immediately after the first session. 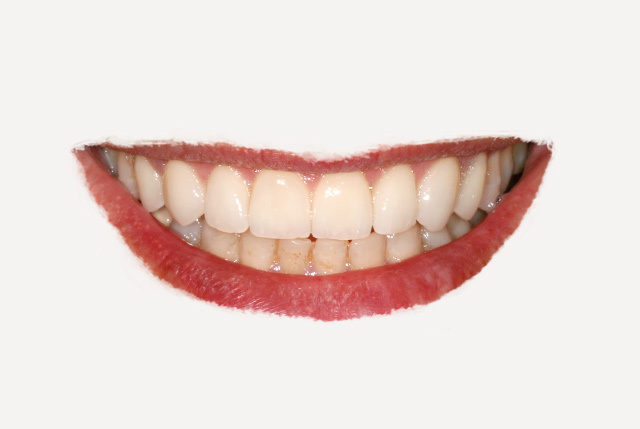 With tooth whitening, we have been able to brighten the tone of the teeth, improve their appearance and highlight their natural beauty. Tetracycline is an antibiotic which until a few years ago was administered to both children and adults. 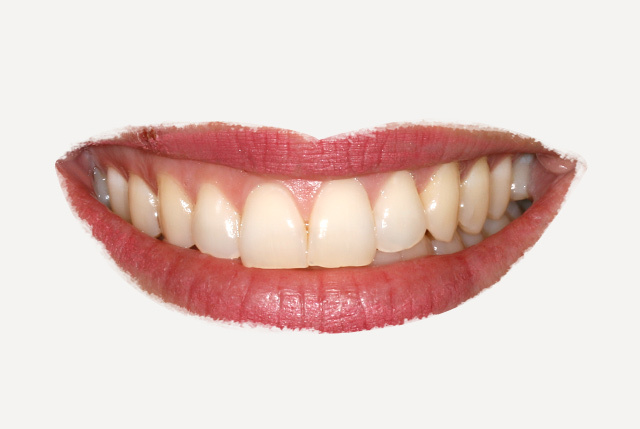 Over time, it was discovered that one of its side effects was permanent staining of teeth as they were forming, before they appear in a child’s mouth. 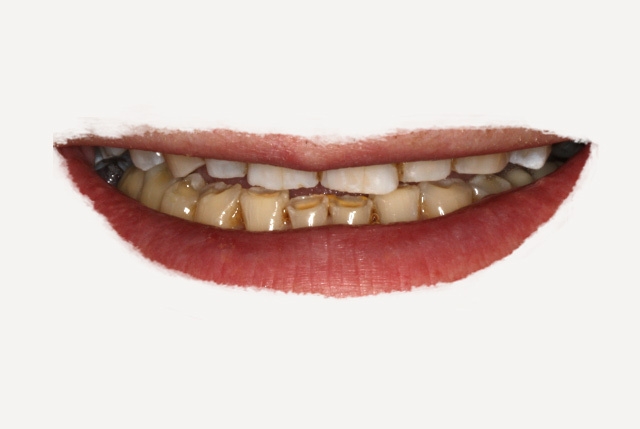 This problem is easily recognised as there are brown or grey horizontal stains on all the teeth. 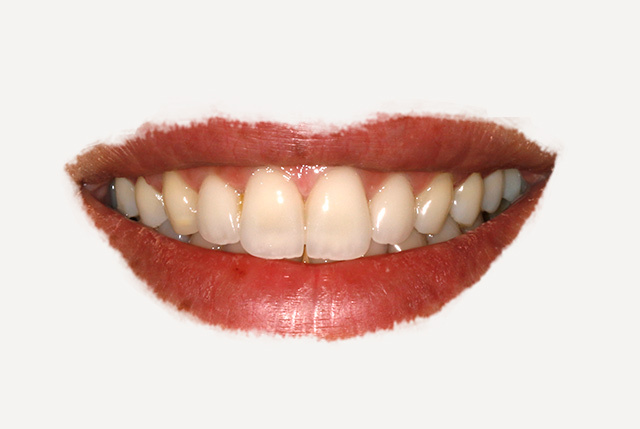 Stains caused by tetracyclines are very difficult to remove with tooth whitening procedures. 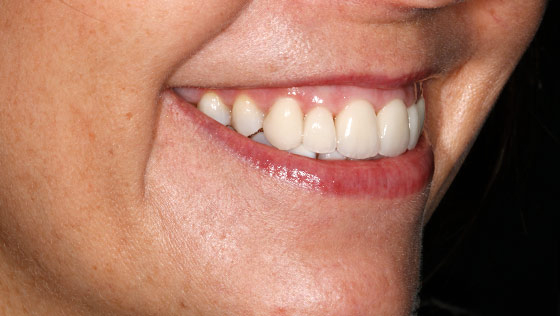 The best results that can be achieved are with porcelain veneers. 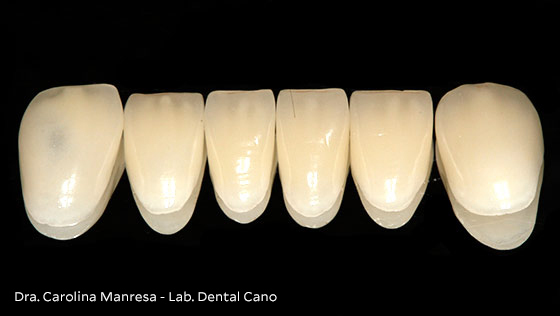 The photos show the state of the teeth before and after this work with completely personalised, skilfully crafted ceramic laminate. 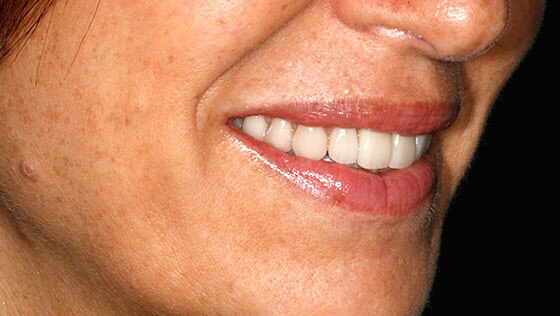 In just four visits, we completely renewed this patient’s smile with the colour, shape and texture of her teeth. 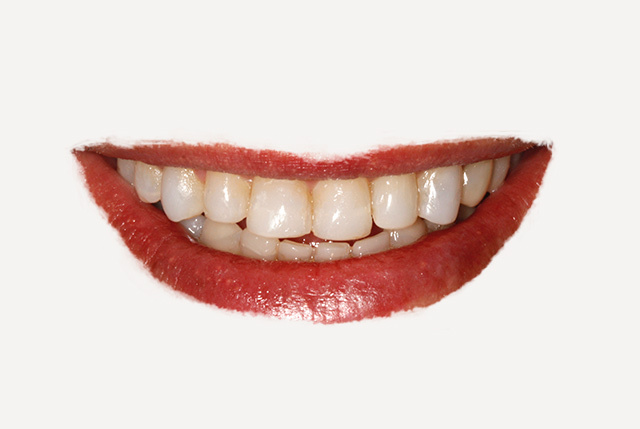 We achieved a natural, healthy smile, eliminating the darkened tone of her teeth that she had found so embarrassing. 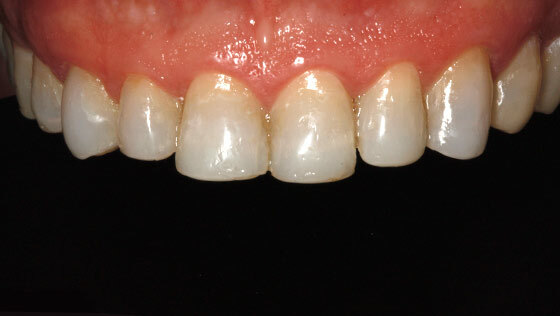 As in the previous case, the darkening of teeth is caused by ingesting tetracyclines when the teeth are forming at an early age, though the dark tone is much greater with this grade. 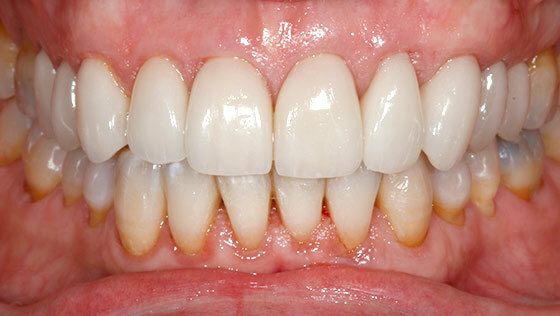 We have seen that stains caused by tetracyclines are very difficult to remove with teeth-whitening procedures. 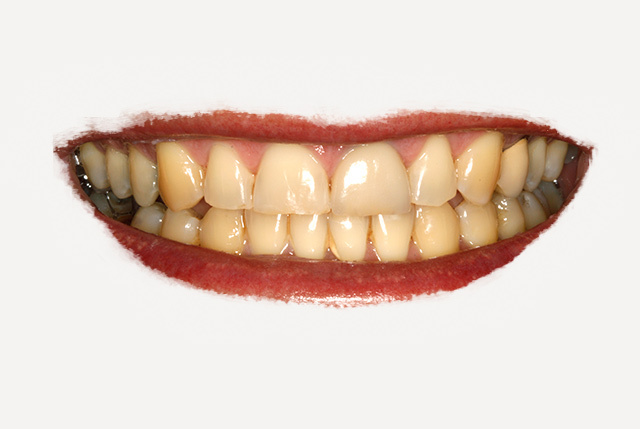 For this reason, a treatment with veneers is used that requires more opaque ceramic materials to mask the very dark colouration of the patient’s teeth. 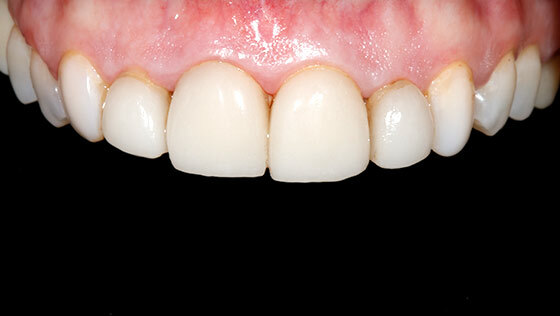 We completely renewed the colour of this patient’s smile with treatment that covered both dental arches. 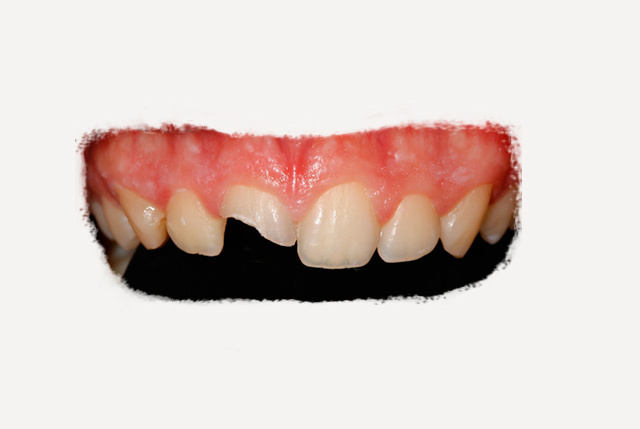 One very common emergency in dental surgeries arises when patients pay a visit after their teeth have suffered some kind of trauma. 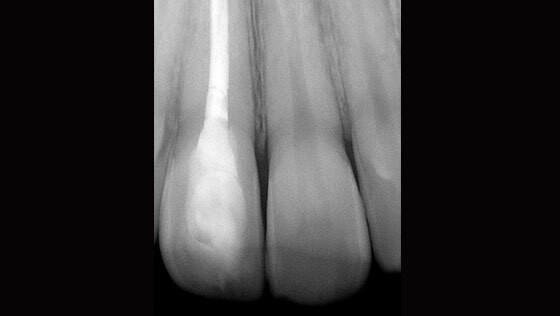 A fractured incisor tooth requires significant aesthetic work. 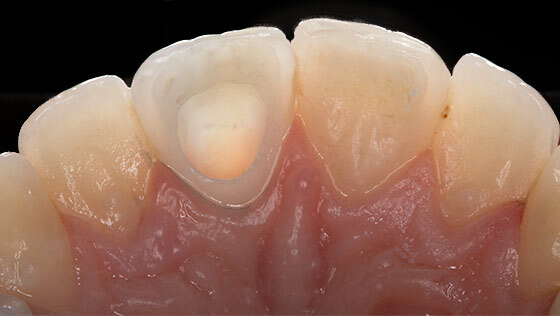 The fractured tooth undergoes aesthetic reconstruction by applying a dental material known as a composite or resin-based composite. 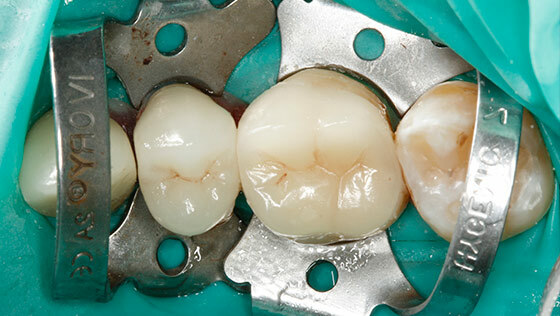 This is one of the most widely used materials in dentistry today for aesthetic reconstruction of the front teeth or for fillings for the back teeth. 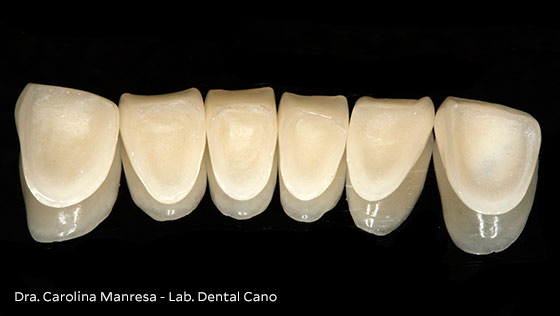 There are more aesthetic composites that enable us to recreate the translucent effect of teeth and the characteristic look of the incisal edges, which is different for each patient. 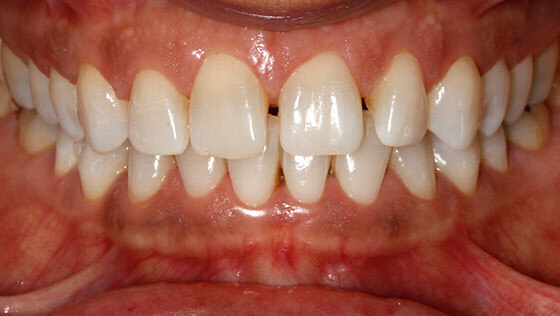 This case was resolved satisfactorily in a single visit and the patient went back to his normal life. 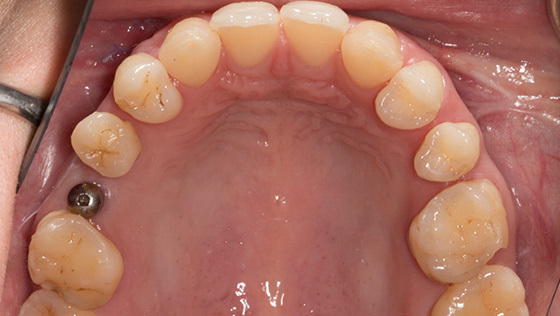 The fractured tooth perfectly matches its corresponding tooth on the opposite (contralateral) side. 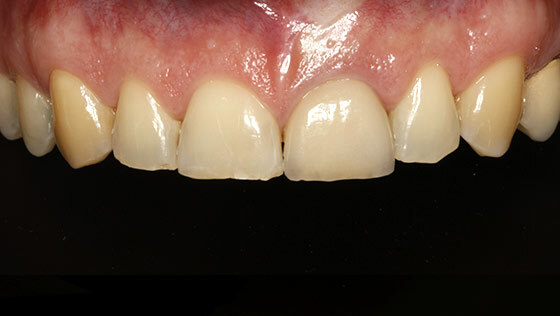 This patient had teeth with a certain degree of wear and extensive prior restoration work on the right central incisor that was carried out due to a previous traumatic fracture. 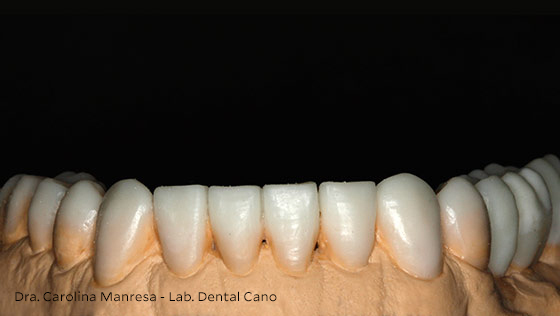 Various aesthetic reconstructions were carried out to correct the teeth’s incisal wear and the right central incisor veneer was also restored with aesthetic composites. 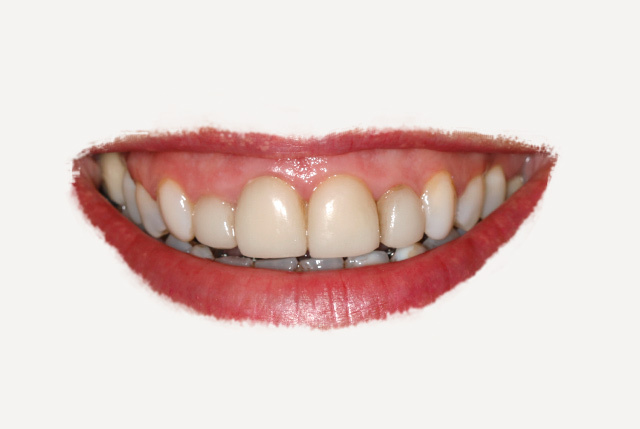 The patient recovered his teeth’s appearance in terms of colour and shape, which now look like they did when he was young. 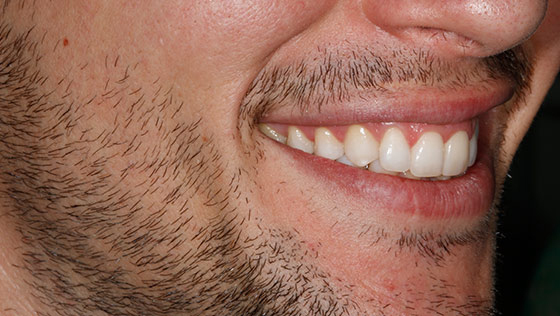 Grinding teeth, otherwise known as “bruxism”, generally occurs involuntarily during sleep. 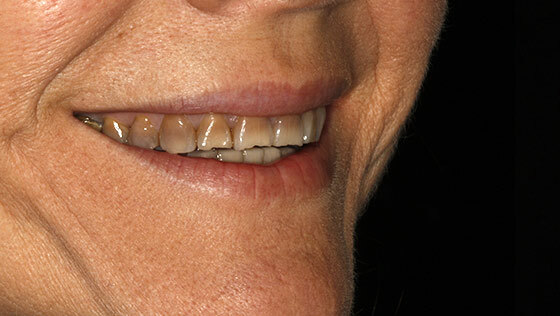 A “teeth-grinder” generally clenches their upper and lower teeth together hard, and also moves them from forwards or backwards, causing them heavy wear. 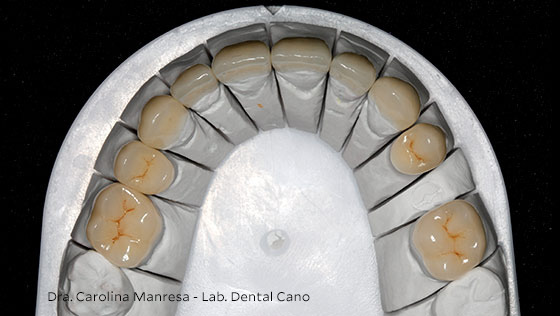 In this case, the wear was greater than 50% in the enamel and dentin. 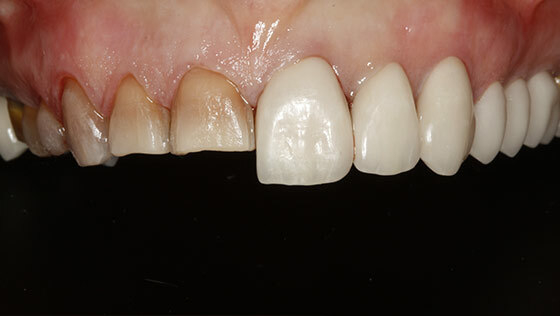 The patient’s entire mouth was rehabilitated with inlays on the back teeth and veneers on the front teeth (adhesive additive techniques), preserving the remaining tooth structure. 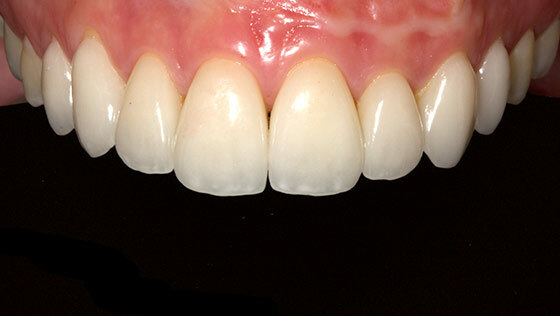 This managed to restore the original size of the worn teeth in the most conservative way possible, avoiding having to “cap” the teeth or crowns, which always involves having to polish them down in size beforehand (reduction techniques). 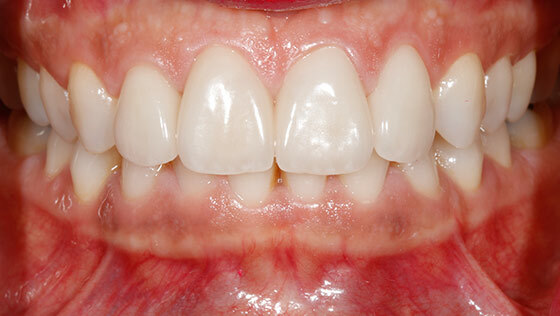 The worn teeth recovered their original size by means of an extremely conservative procedure, also helping to make the patient’s smile look younger. 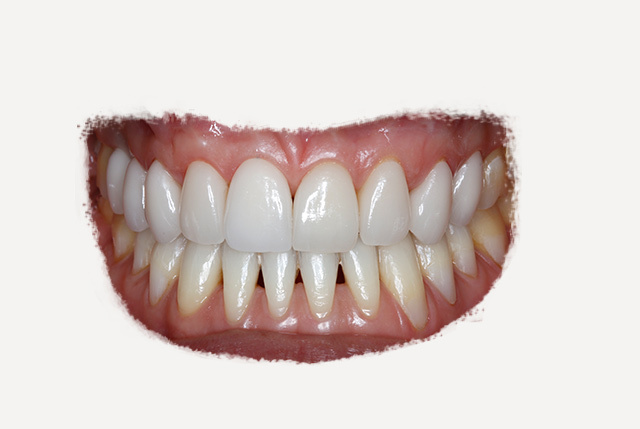 Finally, it is advisable to use a made-to-measure dental protector or guard to avoid grinding your teeth while sleeping, thus preventing more dental wear. 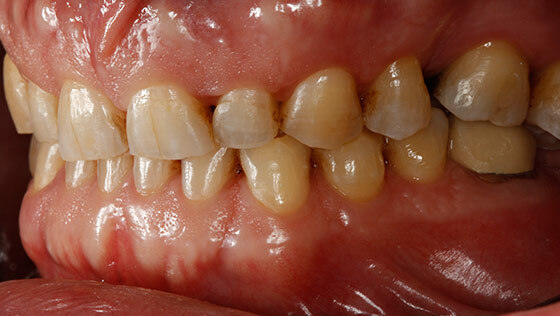 Translucent, fragile teeth as a result of acid erosion (on their inner sides) due to gastric reflux. 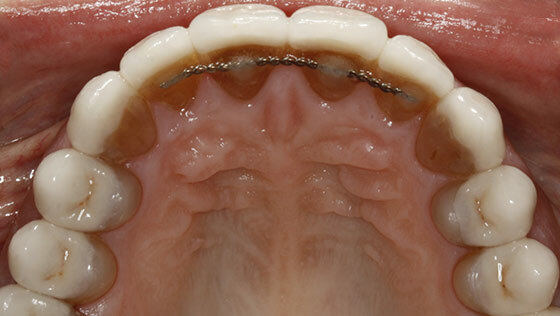 Acid reflux from the stomach can erode teeth by abrading their enamel and even their dentin. This is due to the difference in pH between the acids coming from the stomach and the mouth’s pH. 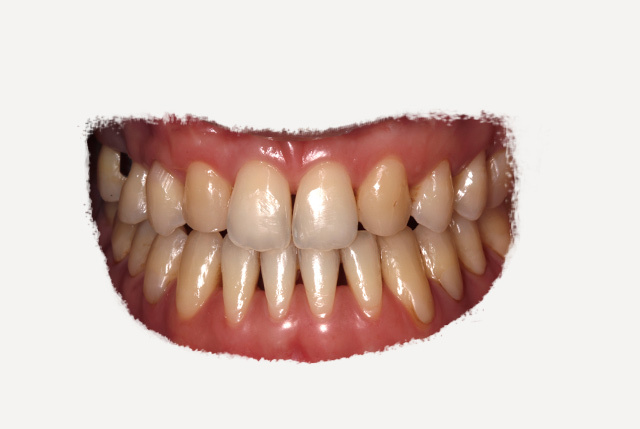 We restored the teeth on their inner or palatal surface, reinforcing them and preventing them from progressively deteriorating. 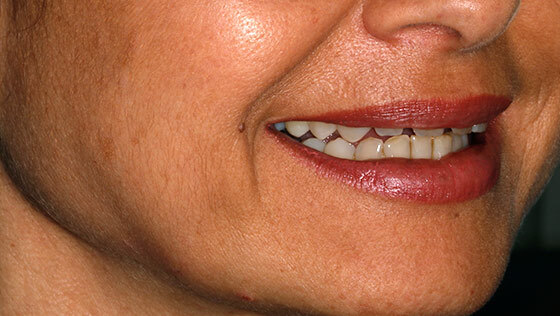 In this treatment, also known as “palatal veneers”, the veneers are usually placed on both sides of the tooth: the lingual or tongue side (for structural and biological improvement) and the vestibular or outer side (for aesthetic improvement). 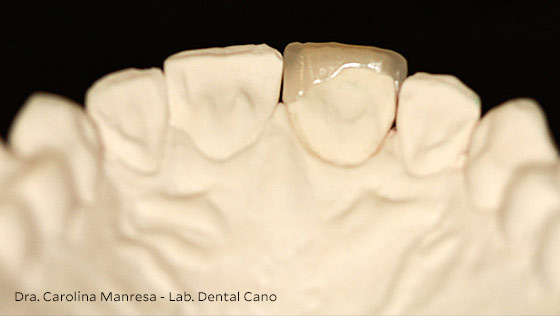 We managed to prevent the sensitivity caused by the exposed dentin and also possible fracture of the teeth due to weakening. And of course, there was a spectacular result from the aesthetic point of view. 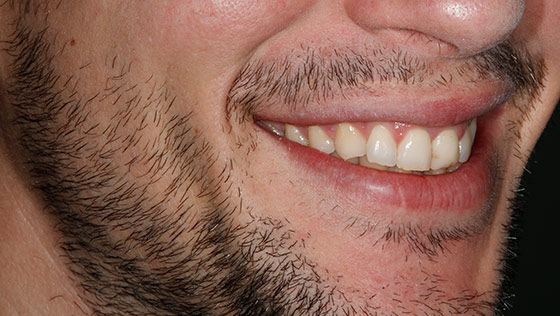 A gap between your teeth or “diastema” doesn’t always look bad. 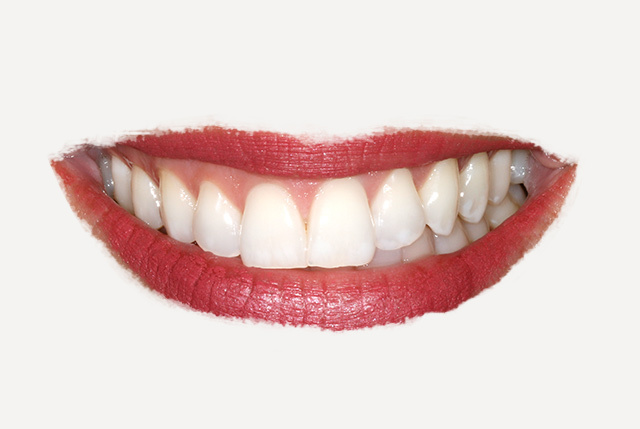 However, it can often give somebody a more childlike appearance or the teeth may not be visible enough when smiling. 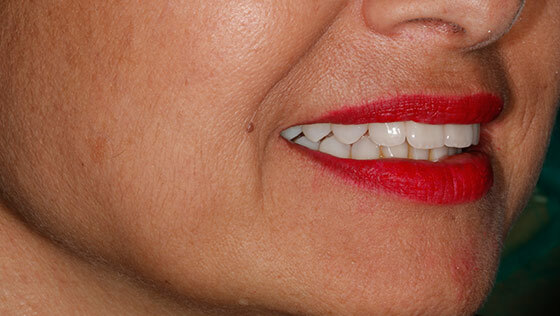 This patient wished to correct the gap between her teeth and also their slight crookedness. 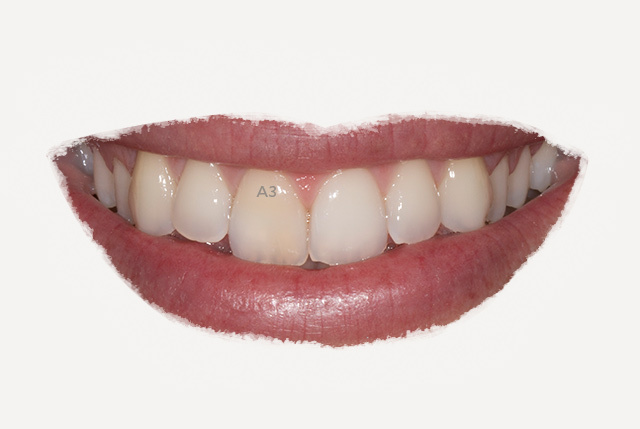 As an alternative to orthodontic treatment, in this case four porcelain veneers were proposed for the four upper incisor teeth that were slightly-to-moderately misaligned. 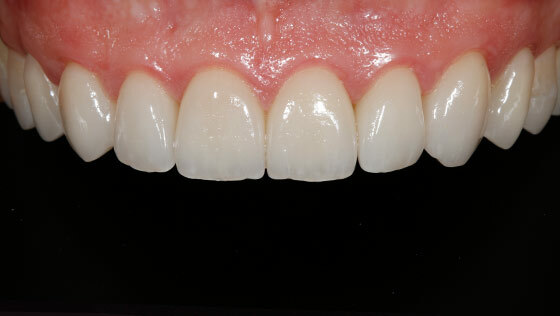 The bite and alignment of the patient’s back teeth were perfectly correct and did not require any other treatment. 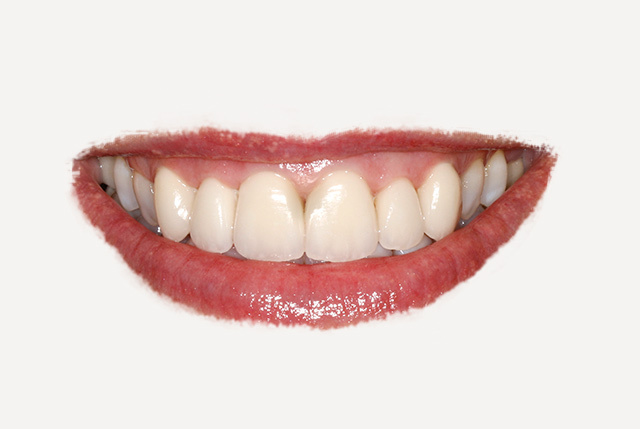 We recovered a natural, attractive smile by placing a minimum number of porcelain veneers, without the need to carry out orthodontics or any other procedure. This patient wanted to improve the appearance of her smile in order to have the mouth of her dreams and help her professional career. We proceeded to place minimally invasive veneers, which are characteristic for being very fine (in fact, they are known as contact lenses). 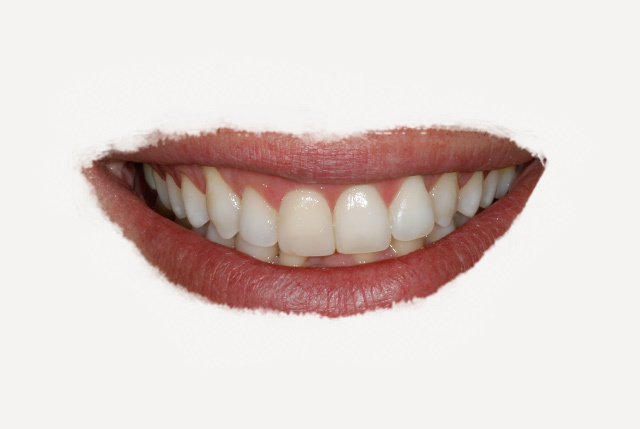 These stick to the surface of the tooth enamel with hardly any preparation needed for the tooth, only doing a little work to make the enamel’s surface slightly smooth so as to put the veneer in place. 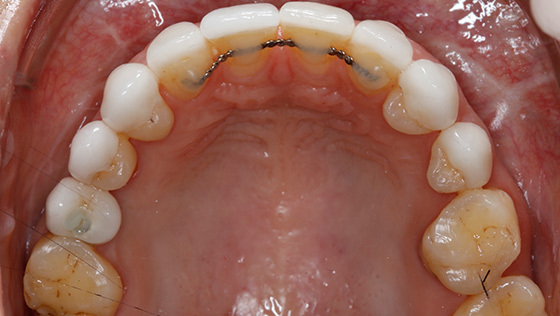 This treatment was carried in collaboration with the orthodontist Dr. Oriol Quevedo. 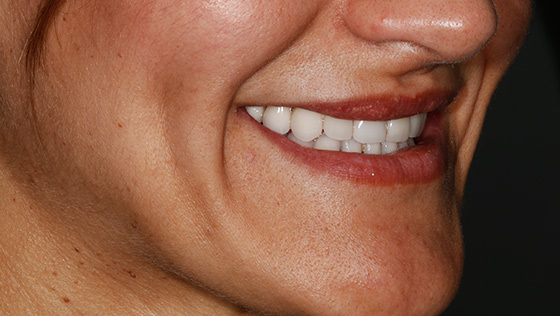 The contact lens veneers go completely unnoticed since they blend in with the natural enamel of the adjacent teeth, giving a dazzling result. The patient has a lot to say in the design and colour of the veneers, since the treatment is completely tailored to the individual. 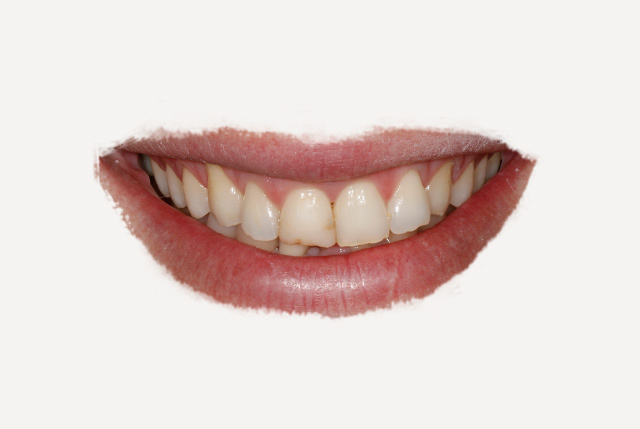 The treatment was a complete success. 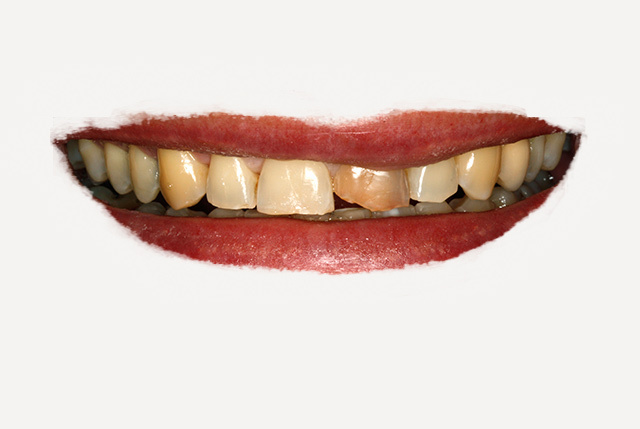 Some patients come to us after having dental treatment in other surgeries that has not met their expectations or they don’t feel comfortable because the end result looks artificial. 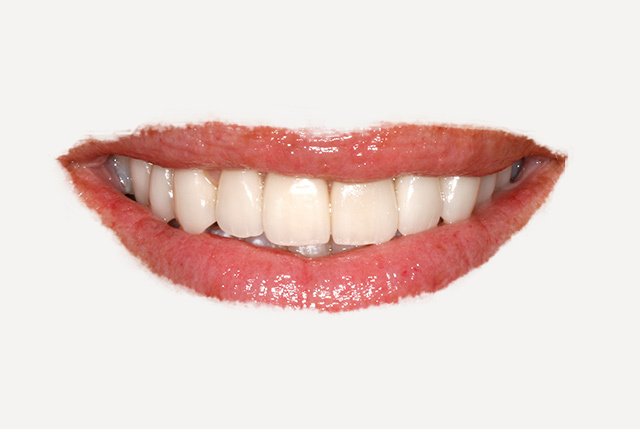 In this case, when the patient smiled she showed six porcelain veneers with a dull, lacklustre matt look. 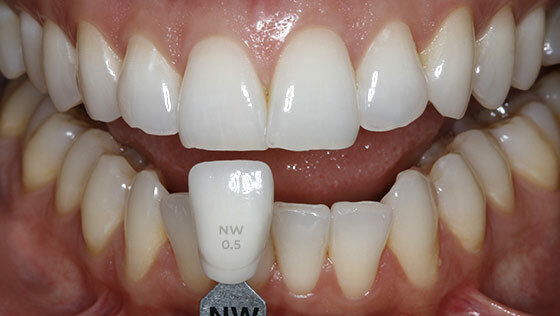 This procedure involved replacing the six upper veneers with new ones made with high quality porcelain (feldspathic ceramic) to give a translucence and brightness comparable to natural enamel. 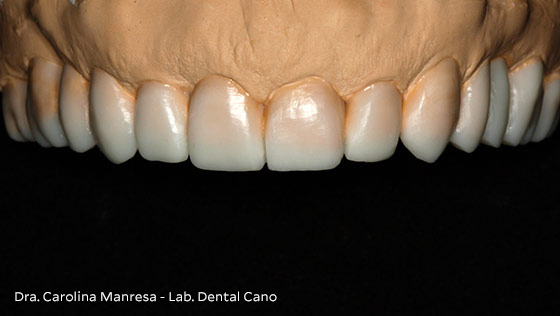 This treatment was carried out with collaboration from the master ceramist Miguel Ángel Cano. 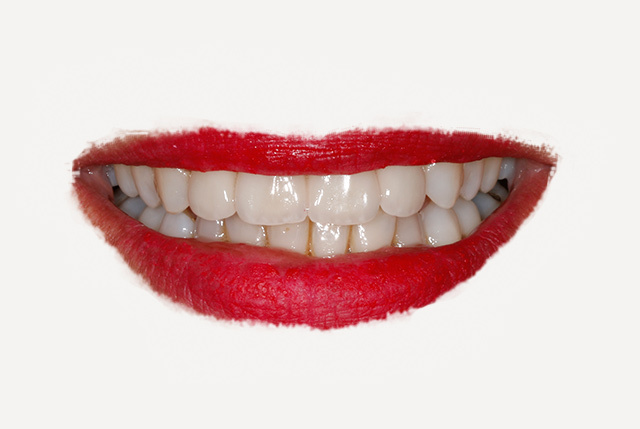 Not all porcelain veneers are the same. 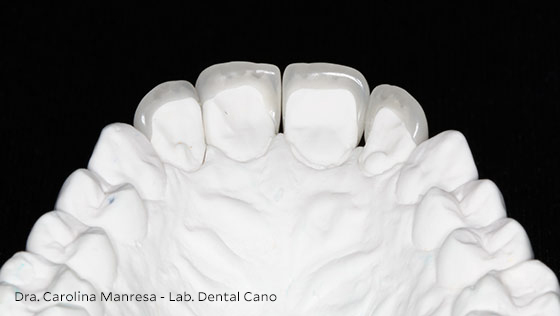 The different types of ceramics and the skilled hands of the technician who makes them both play a very significant part in achieving a natural yet dazzling result. At the end of the day, we shouldn’t forget that this is a very traditional craft that requires experience, manual dexterity and artistic skills. 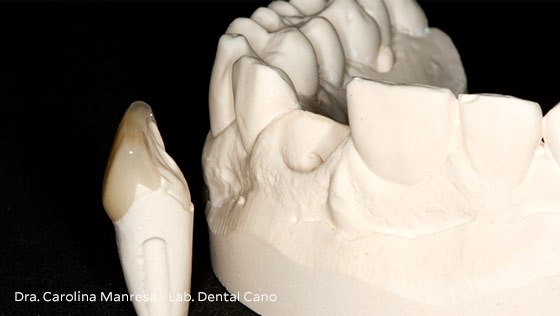 The two materials—composite and porcelain—have advantages and disadvantages. 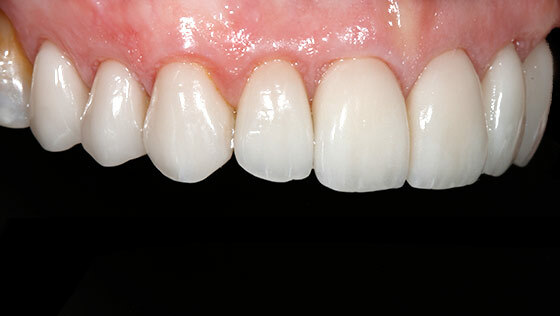 However, this case involved replacing composite veneers with ceramic ones because of their deterioration. 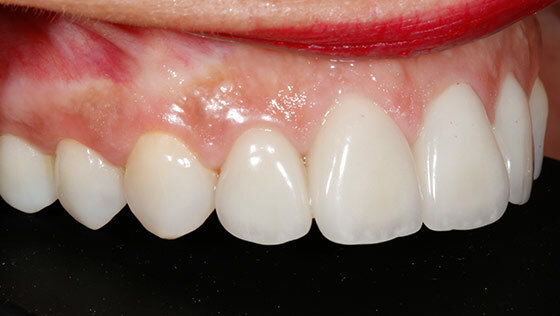 The patient wanted to avoid the regular visits that are necessary to polish the acrylic material, as well as to correct the darkening and the appearance of some spots he had observed on his veneers over the course of time. 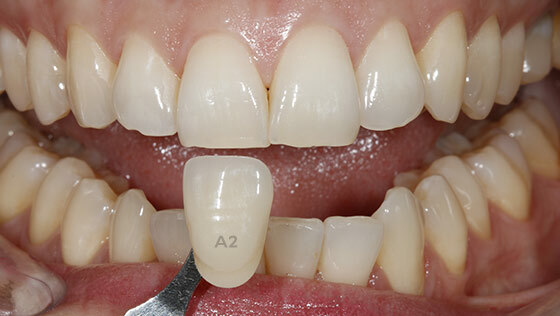 The composite veneers were replaced with porcelain ones. 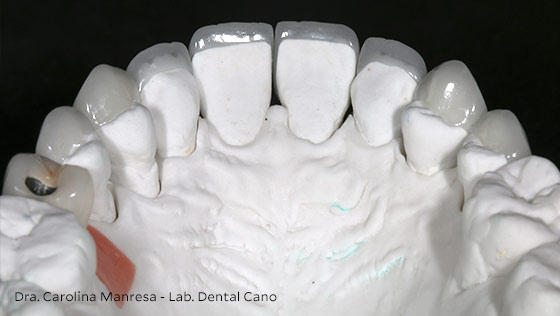 The back teeth had large fillings, so inlays were put in place, also made of porcelain, in order to strengthen these teeth and prevent them from breaking. 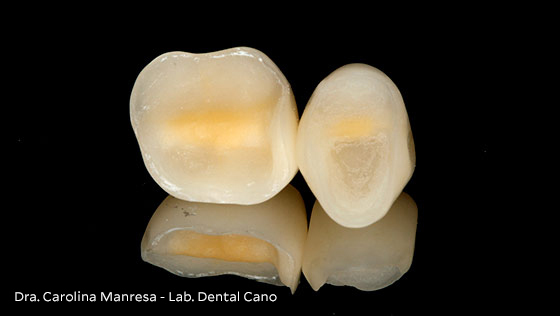 In this case, the replacement of one material with another brought about a qualitative improvement for the patient in terms of colour, fit, brightness, a natural look and long life. 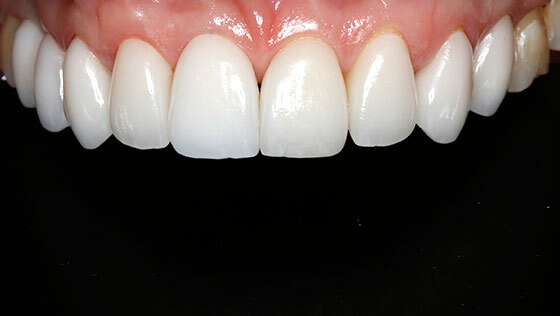 Porcelain is an inert material that does not change colour, wear out or undergo alterations on its surface (polish, shine). Coffee or tea-lovers and also smokers should preferably or directly opt for this material.